Tea and Cream Buns...can life get any simpler than that?! I love this little recipe which brings back so many memories of lovely afternoon cups of tea and delicious treats whilst chatting up a storm or laughing until breathless... one to delight the taste buds! To make the dough: Sift the flour, powdered milk and salt together. B;end the crumbled yeast with the warm water, sugar and melted butter. Set aside for 10 minutes. Stir in 2 cups of flour and beat well. Add remaining flour very gradually beating well to make a soft dough. Knead the dough with a little extra flour until and smooth and no longer sticky. Brush the surface with a little oil, cover with plastic wrap and then a tea towel and allow to stand on the board for 20 minutes in a warm place. Punch down the dough. 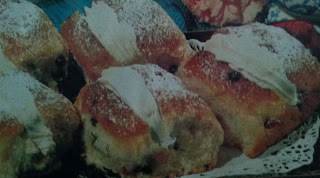 Knead the sultanas, sugar and spice into the dough until it is smooth and ingredients are evenly through. Cut the dough into 12 even sized pieces. Knead each piece and place into a greased 9in square cake tin. Allow to rise in a warm place for 15mins or until buns are well risen. Bake in a hot oven for 20-25mins (190 degrees) Glaze buns very lightly with the warmed honey. When cold, slit the top of each bun and fill with whipped cream. Dust lightly with icing sugar just before serving - delicious!